It’s always sad to see your beautiful orchid blooms begin to wilt and fall off. Have you ever thought of pressing or drying your orchids flowers in order to preserve their beauty? Whether you prefer the look of a pressed flower or if you’d rather preserve the natural 3-D quality of the bloom, you can choose one of two methods. The first method is to press the flowers, and the second method is to dry the flowers without pressing them. Both methods are easy to do and the method you choose depends on how you would like to display your orchid. These simple steps below will allow you to save your beautiful orchid blooms so that you can admire them for many years to come. 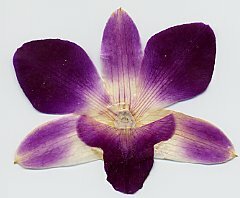 Pressing orchid blooms doesn’t require any special tools or equipment, although you can buy a flower press or even make your own if you would like. If you would like to go the more frugal route, you can achieve the same effect with just a couple household items: newspaper and a couple of heavy books. The first step is to select the orchid bloom that you’d like to press and snip it off of the spike using a sterile cutting tool. For the best results, you will want to use blooms that are at their peak because blooms that have already begun to fade won’t look quite as attractive when dried. Once you’ve chosen and removed your flower, the next step is to take two sheets of newspaper and lay them flat on a table and place the bloom on the newspaper and carefully set two more sheets of newspaper on top of the bloom. Next, open up your heavy book and place your newspaper between its pages. If you’re pressing more than one bloom, flip the pages so that there’s at least 1/8 of an inch of thickness and place the next bloom in between the pages. (Don’t press more than one bloom on the same page of the book.) Close the book and set another heavy book or item on top of it. Check back on the bloom in at least two weeks. This process is meant not just to press the flower but also to dry it out. If you find that the bloom isn’t completely dried out yet, replace the original newspaper sheets with fresh ones, close the book up, and let it sit for another couple of weeks. 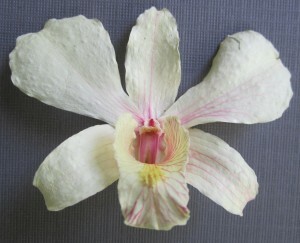 When the orchid has dried out, you can now proudly display your pressed orchid bloom. Drying orchid blooms allows you to maintain the 3D quality of your orchid’s blooms which can be displayed in a shadow box. Drying orchids yourself requires floral silica gel, which can be found at many craft and art supply stores. 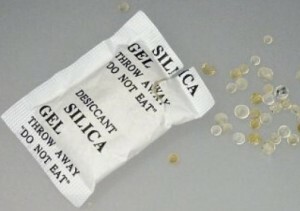 Silica gel is not actually a gel; it’s more of a granular or beaded substance that absorbs moisture from its surrounding environment. Other items you will need besides the gel is an airtight container and a small paintbrush. Again, the first step is to select the orchid bloom that you’d like to dry and snip it off of the spike (leave a little bit of stem poking out from the back of the bloom) using a sterile cutting tool. Remember to choose a bloom that is at its peak in order to ensure you are going to get a beautiful dried flower. Next, you will need to pour a layer of silica gel over the bottom of your airtight container. Depending on how large your bloom is you’ll want to pour in about one to two inches’ worth of gel and then place the bloom into the gel, stem-side down. Carefully pour enough silica gel into the container to completely cover the bloom. If you’re drying more than one bloom, situate them inside the container so that they are not touching each other and make sure each is 100% covered with the gel. is now ready to be displayed! Do remember that many orchid blooms are quite delicate, so the appropriate amount of gentle handling will be needed. Next Steps: Where do you go from here? #1 – More Free Orchid Tips! If you’d like to learn everything you need to know about orchid care (and caring for ALL types of orchids) we also have something called the Orchids Made Easy Green Thumb Club. The Green Thumb Club includes a number of different benefits – including weekly lessons on all different orchid care topics delivered to you in a special, password-protected members area. You also get the opportunity to get YOUR actual questions answered in my weekly “Ask The Orchid Guy” column, which you can check out here. The Green Thumb Club costs less than a meal at McDonald’s – and ALSO includes all sorts of ADDITIONAL benefits, including exclusive discounts at orchid suppliers from 20-40% off as well access to our “orchid diagnosis tool” which helps you identify what problem might be plaguing your plant. Because the club is backed by a full 100% money-back guarantee for a full 30 days, if after checking it out you decide that it’s not for you or that you didn’t get value you out of what you learned – no problem! Simply send us an email to let me know, and you’ll receive a fast and courteous refund. Put it this way: If you’re not happy, I’m not happy! IMPORTANT: To learn everything you need to know about caring for your orchids, if you haven’t already I strongly recommend signing up for the “Orchid Care Tips & Secrets Newsletter” my wife and I publish by clicking here.